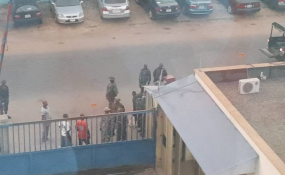 Nigerian Army Targets Newspaper for "Undermining Security"
Nigerian Army invades Daily Trust office in Abuja. The military raided the offices of the Daily Trust newspaper after it reported on a planned operation against the Boko Haram insurgency. The incident has been described as an attack on press freedom. Nigeria's military has been accused of undermining press freedom after soldiers raided a newspaper for publishing a front-page story about a planned operation against the Boko Haram insurgency. Two reporters at the Daily Trust newspaper in the northeast city of Maiduguri were arrested on Sunday, including regional editor Uthman Abubakar and reporter Ibrahim Sawab, and dozens of computers were seized. The military claims it was forced to take action because the newspaper had published "classified security information." However, human rights activists and journalists have condemned the military's actions, describing as a blatant attack on freedom of speech. The newspaper reported that the Nigerian military was assembling thousands of troops and equipment in preparation for a large-scale operation in the northern part of Borno State - the latest attempt to retake Baga and five other towns from extremist group Boko Haram. More than 27,000 people have been killed since the violence broke out in 2009 and approximately 1.8 million are homeless. Army spokesman Brigadier-General Sani Usman alleged the report provided the insurgents with "early warning" and ultimately "sabotaged the planned operations... putting the lives of troops and imminent and clear danger." Alhassan Yahya, the northeast zonal vice chairman of the Nigeria Union of Journalists, told DW the military had no legitimate reason for storming the newspaper's office. "We see no reason [for] an army [to] invade a registered institution, shut down the equipment [and] harass journalists over nothing," he said. "We are calling on them to quickly release the arrested journalists, as well as re-open the [newspaper] so that normalcy will return." The incident quickly evoked memories of media repression in Nigeria under decades of military rule. Opposition campaigners believe it may have been an attempt to intimidate the press ahead of the general election set to be held in February, with the military becoming increasingly sensitive to any form of criticism. The Daily Trust was most recently targeted in 2014 under the previous administration of President Goodluck Jonathan, after publishing articles deemed to be critical of the military. Human rights activist Williams Attah told DW the military's heavy-handed response should be roundly condemned. "The Daily Trust was just [going about] its business," he said. "To say that they have infringed on security issues, I really don't agree. Whatever the reason for [the military's] actions, the way they have gone about it is condemnable." Residents in northeastern Nigeria are equally concerned about the military's apparent attack on press freedom. "It is quite unfortunate," one man told DW. "The journalists are actually working to enlighten the public on what is happening. And I really see [their reporting] as a way of boosting the morale of the Nigerian public towards trusting the military, not the other way around." In 2018, Reporters Without Borders ranked Nigeria 119 in its annual global Press Freedom Index - just under war-torn Afghanistan. Amnesty International Nigeria responded to the raid by claiming the government had an "obligation to protect freedom of the press... as provided by the constitution and international human rights laws."